This post is a sponsored by California Olive Ranch, a year long partner of Heartbeet Kitchen. And the only extra virgin olive oil I use. WE MADE IT. Through winter. It’s been rough all over the country, but especially here in Minnesota. A historic April blizzard dumped 17 inches of snow on us, but luckily, Brian and I had a trip to Nashville planned the very next day. When we arrived home last night, most of the snow was gone and the forecast shows 50’s and 60’s for the foreseeable future. And I can even see rhubarb stalks breaking through the ground! 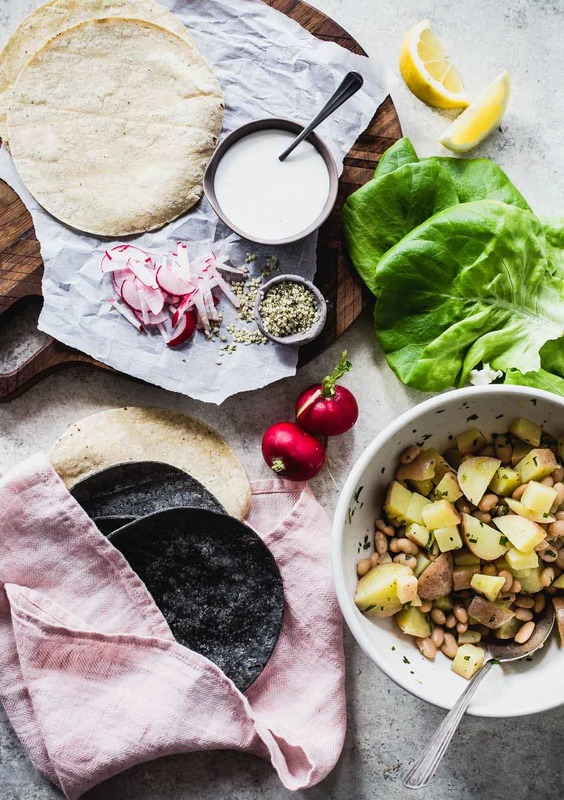 And that means it’s about time I shared these colorful spring potato tacos with white beans marinated in olive oil and herbs, crunchy radishes, sweet bibb lettuce, and a sprinkle of hemp seeds. To tie it all together, a tangy garlic yogurt sauce is drizzled liberally across the top. And avocado if you’re feelin’ it! Vegetarian tacos lack absolutely nothing to those of the meat type if the main components are flavorful, and there are a variety of textures. 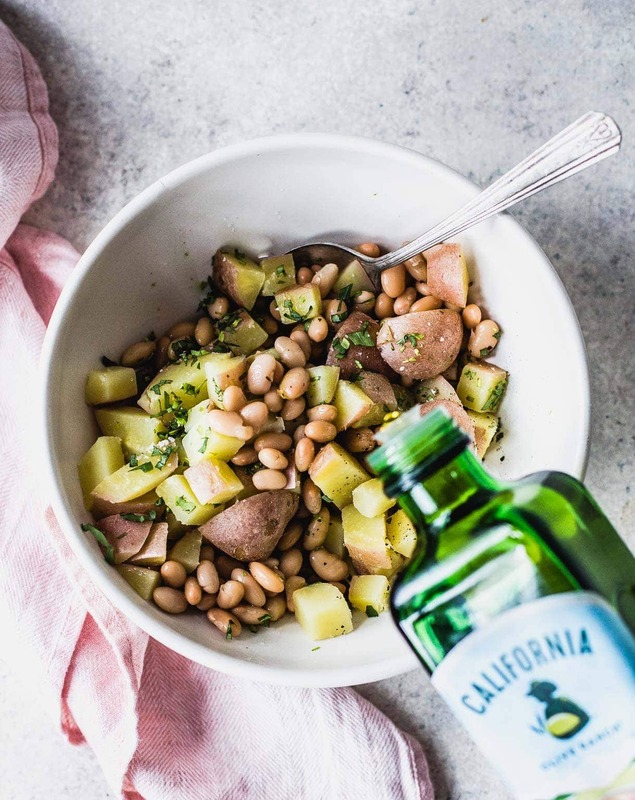 For this recipe, you’ll infuse the potatoes and beans with California Olive Ranch’s Rich and Robust extra virgin olive oil while they’re warm, which allows the (healthy) fat, and ultimately flavor, to permeate throughout. 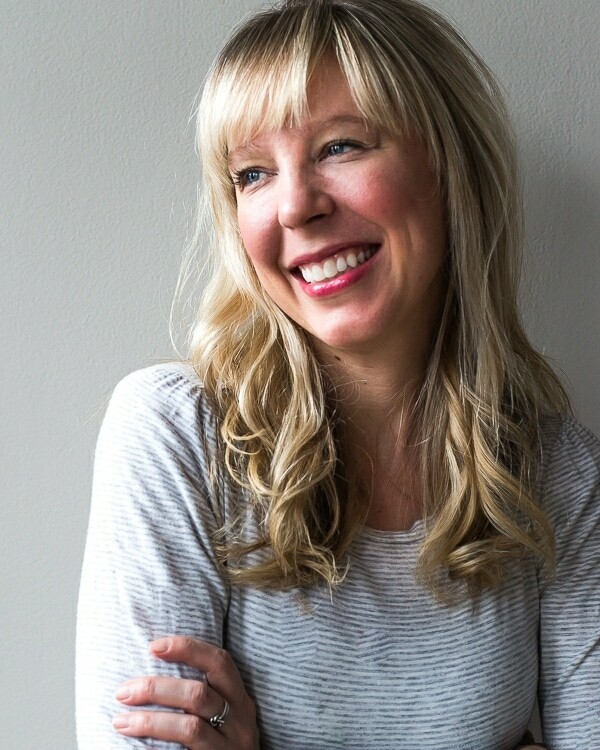 I particularly love the Rich and Robust (which is in the Everyday product line – always cold pressed and very affordable) because it’s smooth and luxurious, with a peppery kick. Exactly what I want with tacos! The beauty of using the best quality olive oil with fresh vegetables is that it really allows both to shine, erasing the need for extra ingredients. I added a bit of salt and pepper to the mixture, as well as one of my favorite spring herbs, tarragon, which has a unique anise flavor, and is lightly sweet. And because every good taco in my opinion has a delicious sauce, I went with a tangy garlic yogurt blend with a hint of lemon. Crave-worthy. It adds a creamy, cool compliment to the vegetables, and also helps them stick to the tortilla. Side note on tortillas: I’ve recently fallen in love with those from Masienda. I’ve had a difficult time finding any that don’t have gums or stabilizers, until now! These are made from heirloom, non-gmo corn, lime, and water. That’s it. Fresh-pressed. And they’re soft as soft can be, with an earthy, nutty corn flavor that blooms when the tortillas are heated. 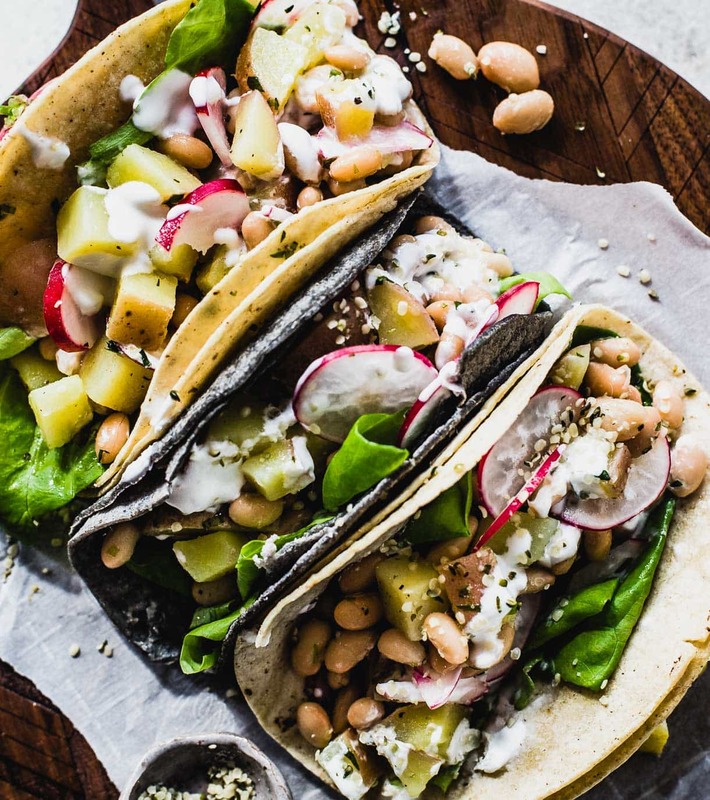 If you make these potato tacos, tag me on Instagram, @heartbeetkitchen or with hashtag #heartbeetkitchen so I can see your creations! Bring a medium pot of water to a boil. Add 1 teaspoon salt, then potatoes. Simmer for 8-9 minutes, until they are fork tender, but not falling apart. Remove from heat and drain. 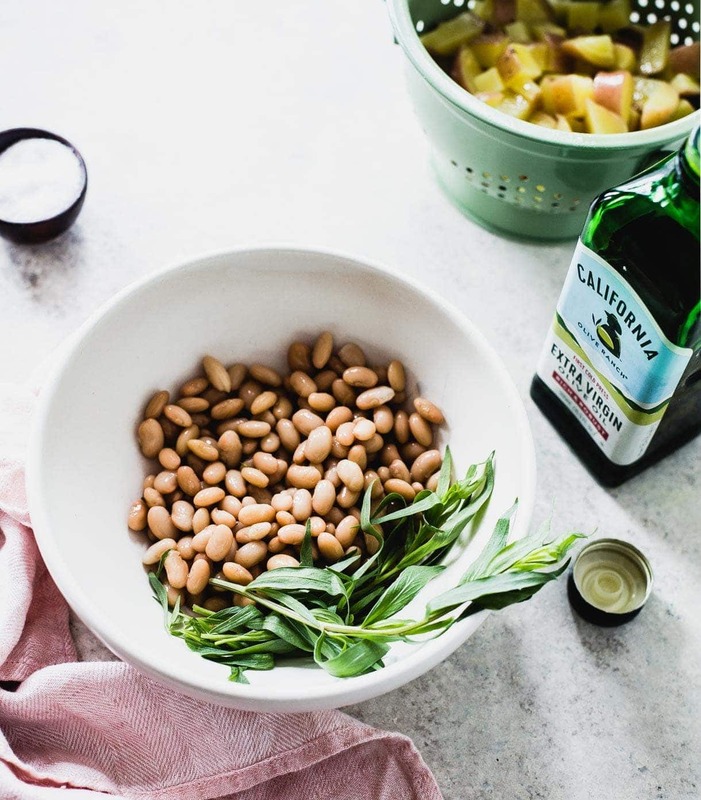 In a large bowl, mix them with the beans, olive oil, salt, pepper, tarragon, and white wine vinegar. Let sit for 10 minutes. Meanwhile, make the garlic yogurt sauce by whisking everything together. 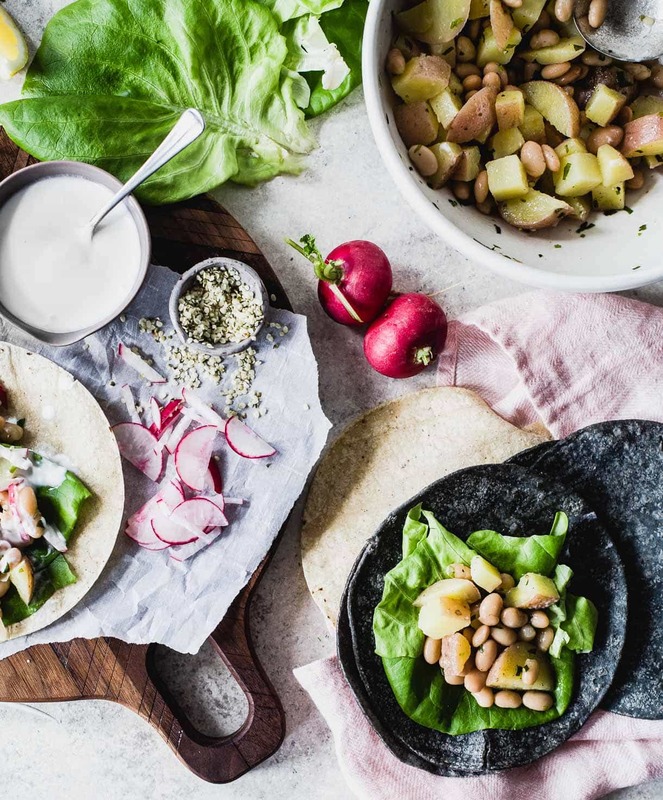 Assemble tacos, spreading a thin layer of sauce on the surface, then adding lettuce, potato mixture, radishes, hemp seeds, and more yogurt sauce. I also like to add avocado or feta cheese. Potatoes in a taco is all I ever needed. Whoa, xo. 2.) Our fave olive oil. I bought it once randomly and won’t buy anything else. Perfect timing ! Thaak you ! Nothing excites me more than using fresh and colorful ingredients for lighter recipes! I do like warming and cozy dishes such as soups and stews, but I do have to say–fruit season. Nothing beats that! 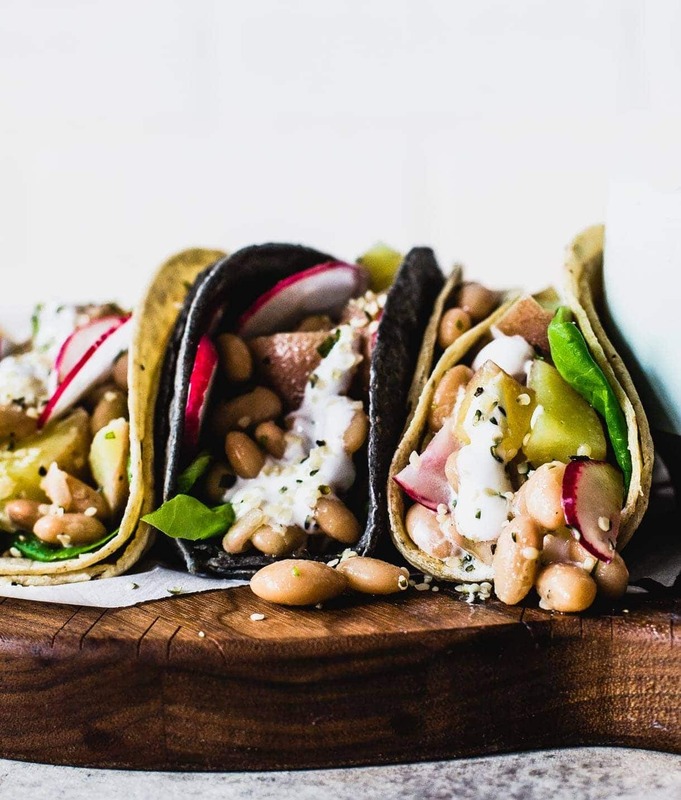 These spring tacos look amazing–I LOVE beans wrapped in tortillas and paired with other veggies. The hemp seeds in yours add the most perfect crunch!